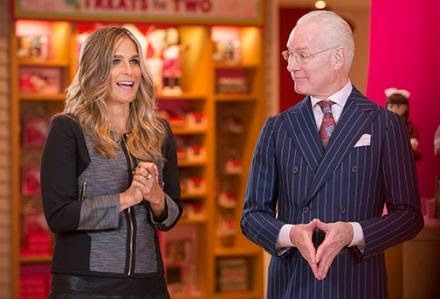 (L to R): Heather Northrop, Sr. Design Manager "American Girl" and Tim Gunn--Episode 9 Season 13 "Project Runway"
The designers gathered at the American Girl Place NYC store where they got their dolls...and models--Episode 9 Season 13 "Project Runway"
Farrah Fawcett "Beauty Head"--I styled that "feathered" hair over, and over...and over again. 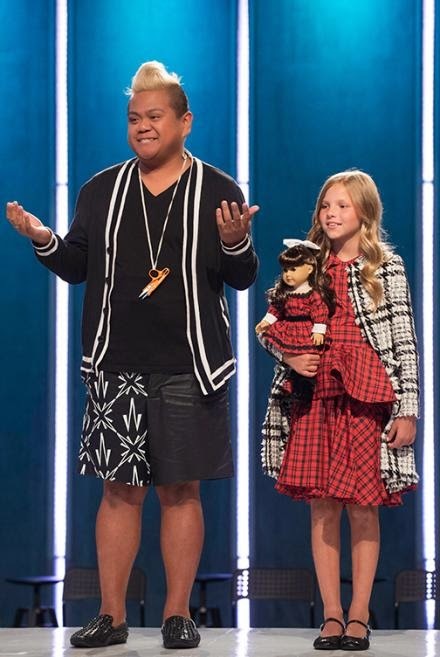 Fringe Moments of Season 13 "Project Runway"
Kini Zamora: The winner was Kini and his Houndstooth and red-and-black plaid looks. They were LUXE, well-made (of course) and super fashionable. Sean Kelly: A yawn, to say the least. A bit too bland for an 8-12 year-old. That jumpsuit looked like a hand-me-down pajama. 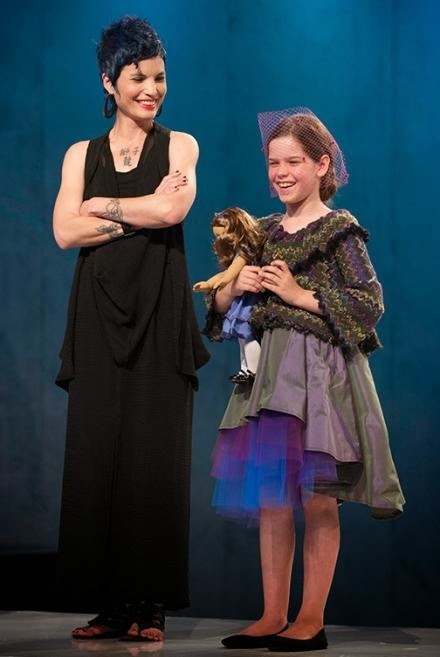 Emily Payne: While I give props to ALL the little girl models and Emily's worked it really well...Emily's design of a taffeta hi-lo skirt, multicolored tulle and zigzag crochet knit sweater drowned her little model and aged her. Can you say "Babushka"??? I'm sure that this will not be a shock to anyone, but I played with dolls. 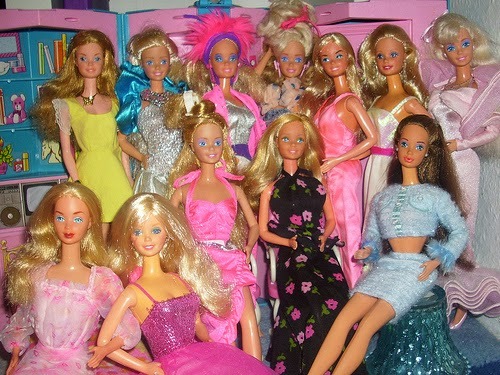 I played with my sister’s Barbies as well as her Farrah Fawcett “Beauty Head” doll. 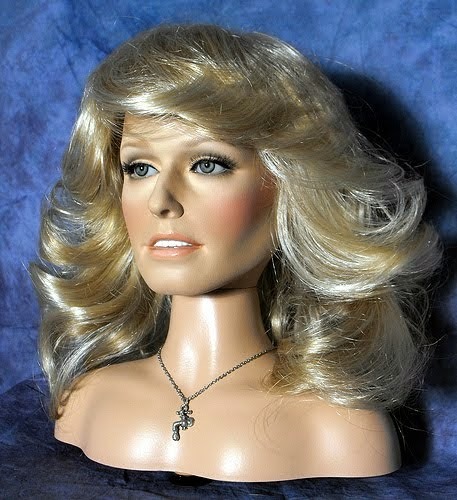 I would style the Barbies in different outfits and do Farrah Fawcett’s feathered hair over and over again. 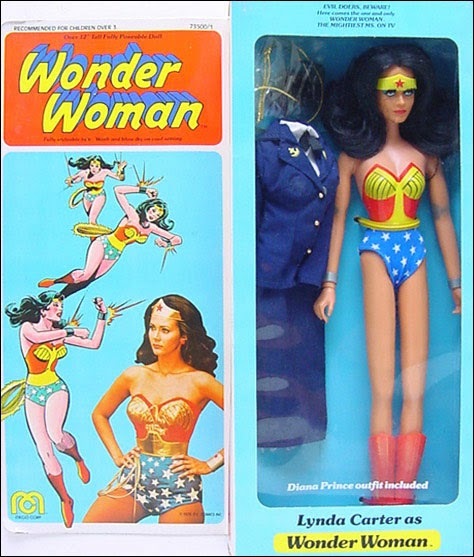 But I never played with American Girl dolls; my sister didn’t own one and heck, it wasn’t until only several years ago that I found out what they were. I accompanied my partner David on a shopping trip with his very young niece to an American Girl store. Only then did I get indoctrinated into this world of American Girl. 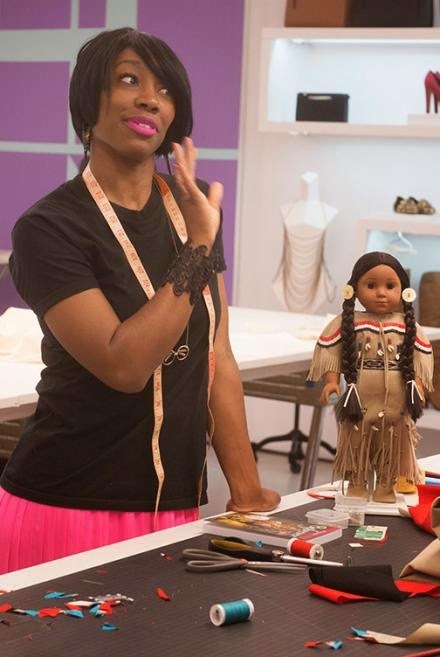 This week’s episode was of course, about the American Girl dolls. 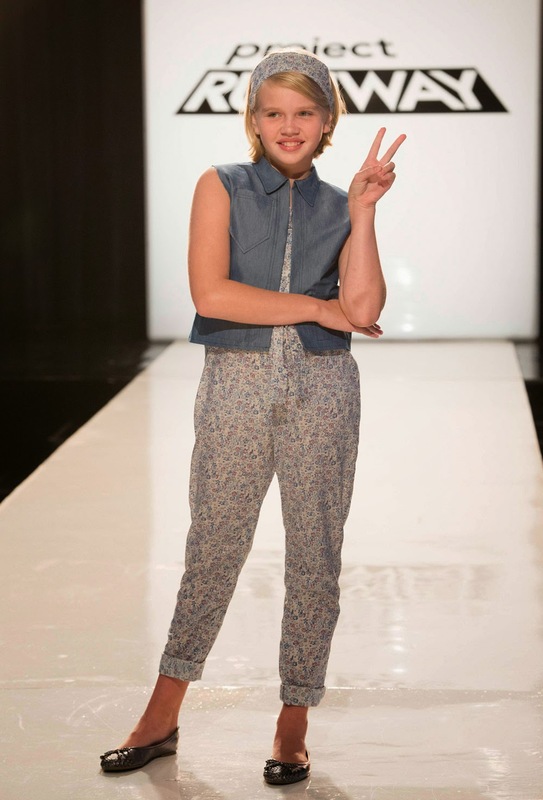 But it was also about the most polarizing of the Season 13 designers, Sandhya. 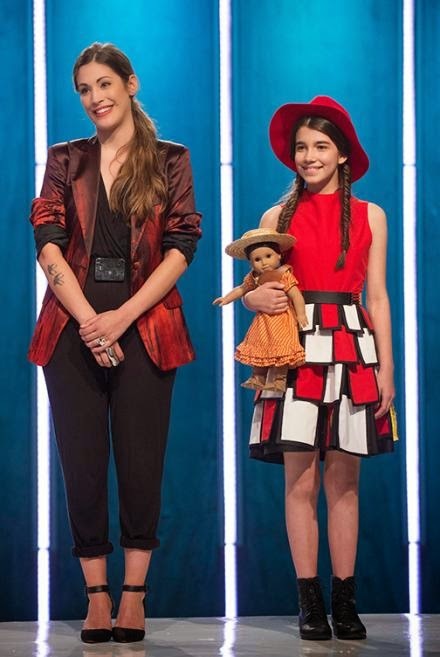 Time to discuss dolls and much more. The designers meet up at the American Girl Place NYC. 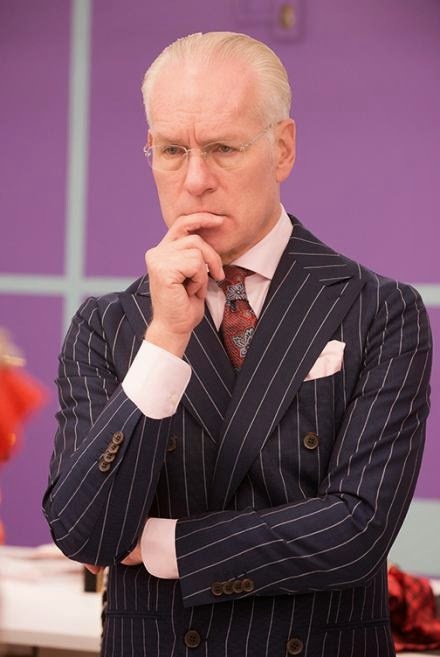 Tim Gunn is there, along with Heather Northrop, Senior Design Manager for American Girl. Tim mentions that Heather has been with the company for 22 years (Did she start as a doll model at six? Because she looks like she’s only 28!). 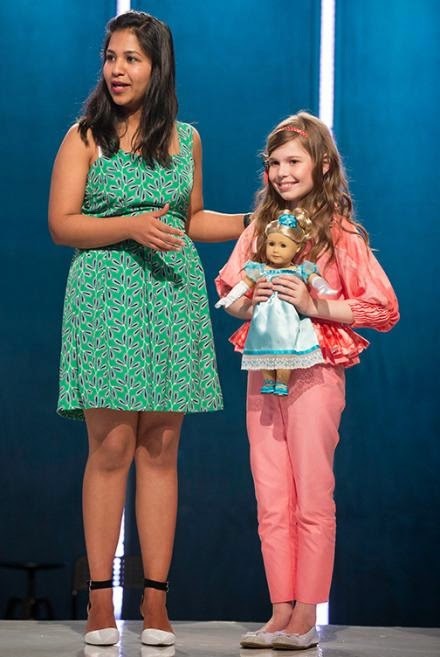 They both introduce this week’s challenge: to create a modern and fashionable look for a young girl inspired by an American Girl doll from the “BeForever” collection. 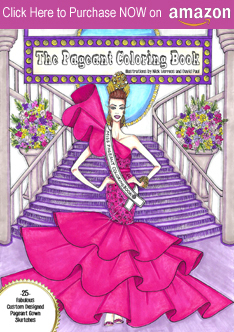 Each historical doll has a full story -- from a girl whose parents are Russian Jewish immigrants to a Native American girl who cares for her blind sister. Not kidding. 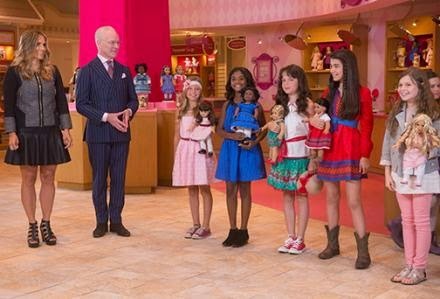 Eight young girls walk out holding dolls from the “BeForever” American Girl collection. 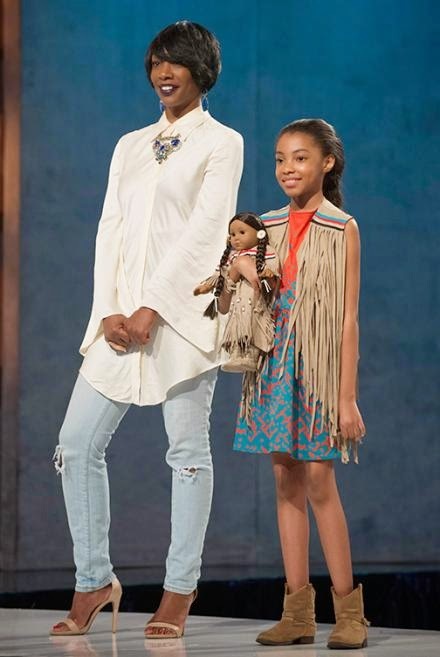 Each designer is paired with a doll and the little girl as their model. Tim explains that the designers’ point of departure should be the time period, style and story of each of the dolls’ characters. 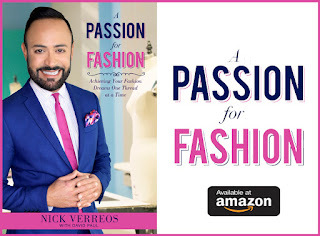 2 Responses to "PROJECT RUNWAY.....Season 13 Project Runway Episode 9 Recap: American Girl Glamour"
Like you, I was in Camp Sandhya for most of the season, and like you, I have to agree that the girl's outfit fell flat on its face and was totally auf-worthy. However, I might have had Alexander in Sean's place in the bottom three and might have eliminated him or Emily before Sandhya. You nailed it when you said "babushka." Zac referred to Emily's girl still being in the shtetl, and I definitely had flashbacks to my immigrant grandmother's frumpy wardrobe.